As a member of the Academy of Nutrition and Dietetics, I get to choose a state affiliation. Since I’m living in West Virginia for grad school, I am currently a member of the West Virginia Academy of Nutrition and Dietetics (WVAND), and it’s been a fun way to get to know other dietitians in the state. 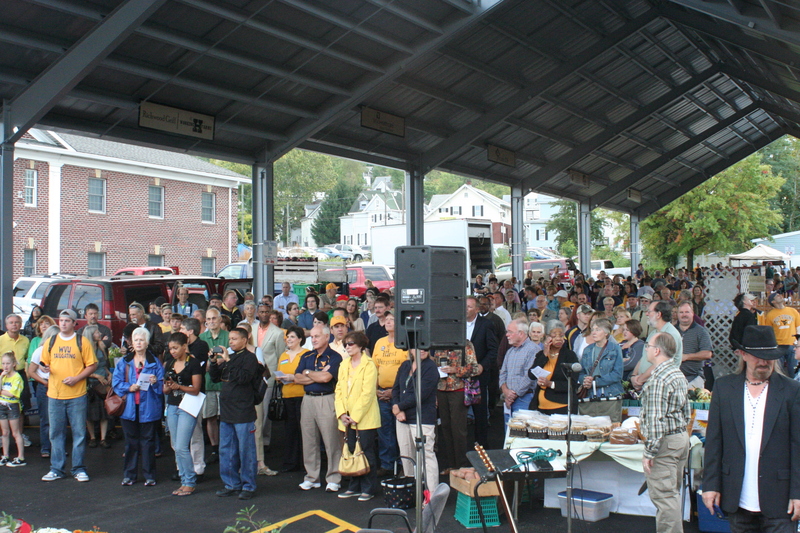 At the 2012 WVAND meeting, I committed to supporting local foods in my community, and I met that challenge by coordinating a gleaning project from the Morgantown Farmers’ Market. I enjoyed coordinating this pickup and subsequent distribution to the local Salvation Army soup kitchen. My project description was just posted on the WVAND Website, and I thought I’d share it here as well! “This past summer, after a suggestion from RoundRight Farm, and in collaboration with a graduate student in Ag Economics at the Davis College of WVU, I coordinated a market gleaning program from the Morgantown Farmers’ Market to the Morgantown Salvation Army Soup Kitchen. Every Saturday as the market closed, myself or another volunteer walked around to each stand at the market to ask vendors if they had extra produce would like to donate. At the beginning of the summer, when there were just a few bags of greens, it was easy to walk the produce down the street to the soup kitchen. However, as the season progressed and beans, beets, tomatoes, and other hefty veggies were abundant, a car was necessary to transport the bounty. The vendors were glad to see their produce being put to use, and the soup kitchen was creative in their use of the veggies. When I stopped by to see what they had made, they were serving green beans with sliced radishes! We would love to see this project continue in the future, and are in the process of making plans to formalize, improve, and expand upon our current model. Perhaps this is even something that could be replicated around the state in other farmer’s markets. If anyone is interested in providing future assistance in this program, either by helping with pickup, or potentially making a special dish out of the produce to serve at the kitchen, we would love to hear from you! Categories: Community Nutrition, Local Foods, Professional Development | Tags: agriculture, dietetic internship, farm market, food, local foods, Salvation Army, sustainability, West Virginia | Permalink. It’s really all about the dirt. The brown stuff that we walk on, brush off our shoes before we go inside, and even scold our children for playing in. (Side note: I grew up playing outside on my parent’s farm. I was not scolded for playing in the dirt, unless I was wearing my going-away clothes. Once I even made cookies out of mud and my cousin ate them. Literally. I learned to embrace soil at a young age). Humans grow and are nourished by food, and food is grown in and nourished by the soil. Therefore we, as humans, owe some respect to this beautiful brown substance. In 2010, the National Nutrition Month theme for the Academy of Nutrition and Dietetics (the ADA at that time) was “Nutrition from the Ground Up”. I was a big fan of that theme. By treasuring our soil, we are preserving a precious resource. One of the ways that we can accomplish this is through recycling our food by composting. Fruit and vegetable scraps, paper, even lint from your dryer can be turned back into soil through natural biological processes. When I moved into an apartment for grad school, I knew that I wanted to avoid throwing food scraps into the trash and the resulting greenhouse gases produced by such actions. So, I began researching options for composting in a small space, and I ended up with a vermicomposting system. Basically, it’s a plastic tub with worms in it where I throw my fruit and vegetable scraps for the worms to eat and produce worm castings, which are incredibly nutrient rich. The other day I decided to empty out all of the chocolate brown goodness into my garden to prepare it for next year’s growing season. I emptied the few remaining beets out of my garden, and proceeded to work the worm castings into my soil. If you notice, my Swiss Chard is still thriving because of the mild weather thus far. I tear off a leaf or so and cut it up in my meals- I love having fresh greens in December! Categories: Local Foods | Tags: agriculture, food, health, local foods, nutrition, vegetables | Permalink. Finally, it feels like fall. The weather was rather overcast today, but 40’s seems more appropriate for late October than the 70’s and 80’s that we’ve had the past few days. And I love fall. I adore the brilliant beauty of the trees as they change color (and the mountains of West Virginia offer a SPECTACULAR show), the chilling of the air, wearing cozy sweaters and scarves, the crunch of the leaves under my running shoes, and the smell of cinnamon and baking apples. After finishing up my first week of clinical rotations at Charleston Area Medical Center, I decided to spend my Saturday doing a bit of exploring. Well, first I stayed curled up in my bed and finished reading “The Color Purple”, then came downstairs to a surprise breakfast of waffles (the family that I’m staying with is wonderful!). After that my exploring began. I went for a run through the surrounding leaf covered streets, then headed off to town. Big surprise, eh? If there’s a farmers’ market, there’s a good chance I’m going to be there. I find it hard to stay away. In addition to several permanent stores inside, there was a wide array of fresh produce, gourds, live music, and art displays outdoors. 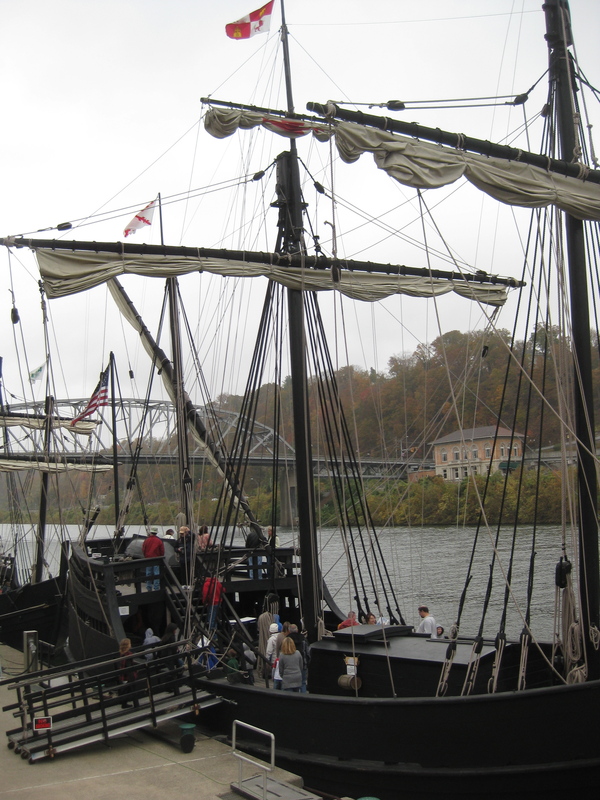 Second stop: the Nina and the Pinta. Yep, replicas of the ships that Columbus and his crew sailed across the ocean 500 years ago have come to dock in Charleston. Did you know that vitamins were discovered because of riding on ships? That’s right. Scurvy– a disease caused by the lack of vitamin C- was first treated effectively in the mid-1700s by a Scottish surgeon in the Royal Navy, James Lind when he provided citrus fruit to sailors who were previously subsisting on cured meats and dried grains. 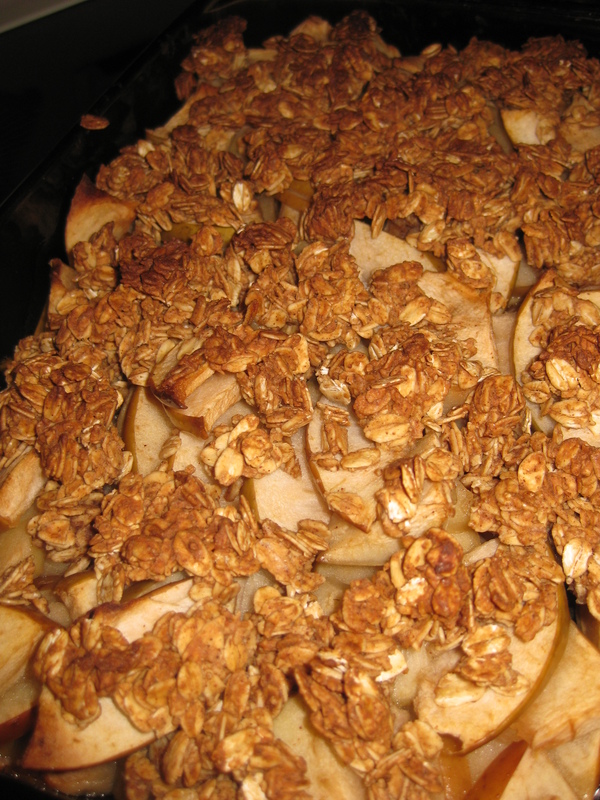 I decided to whip together a favorite fall dessert: apple crisp. On average, one medium apple (2 1/2 inches in diameter) contains about 8 mg of vitamin C. However, the content does vary by apple variety. And almost half of the vitamin C is located right beneath the skin, so be sure to keep the skin on so that you’re not cheating yourself out of vitamin C and insoluble fiber. I use recipes a lot in the kitchen, but I also love to just cook intuitively. Apple crisp is something that I don’t really use a recipe for. 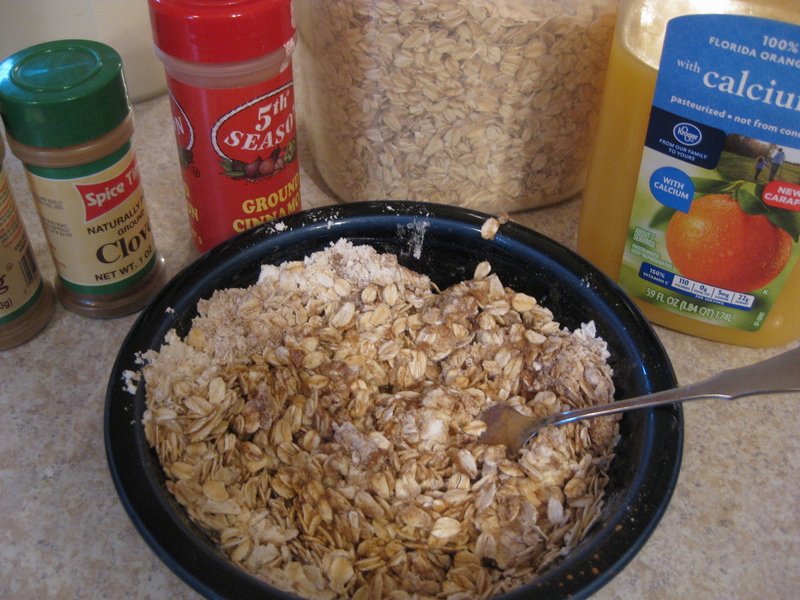 Using the juice cuts down on butter, and makes a nice crispy sweet crumble. Bake at 350 degrees Farenheit for about 35-40 minutes. 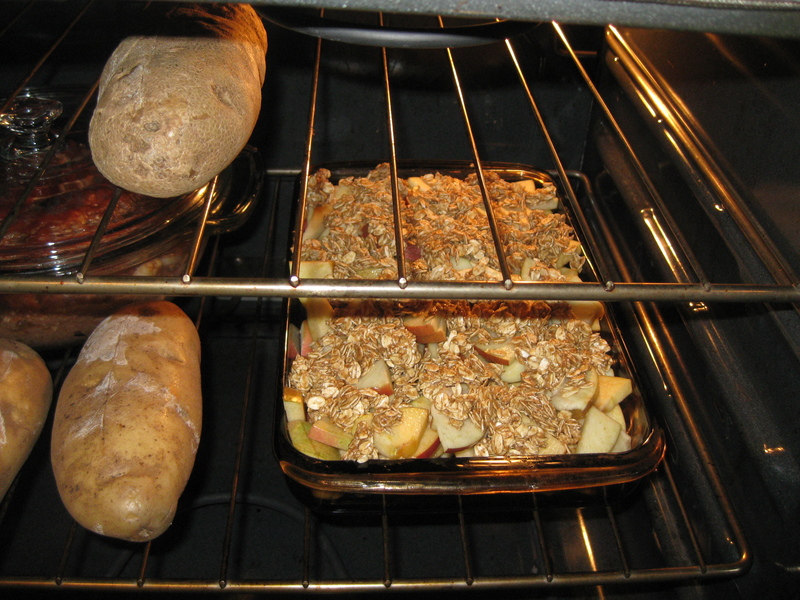 Apples aren’t too picky- temperature and time can be altered depending on what else you have going on in the oven. Just watch for the topping to turn brown. Then pull out of the oven and enjoy! If you couldn’t tell from my previous posts here and here– I love apples. 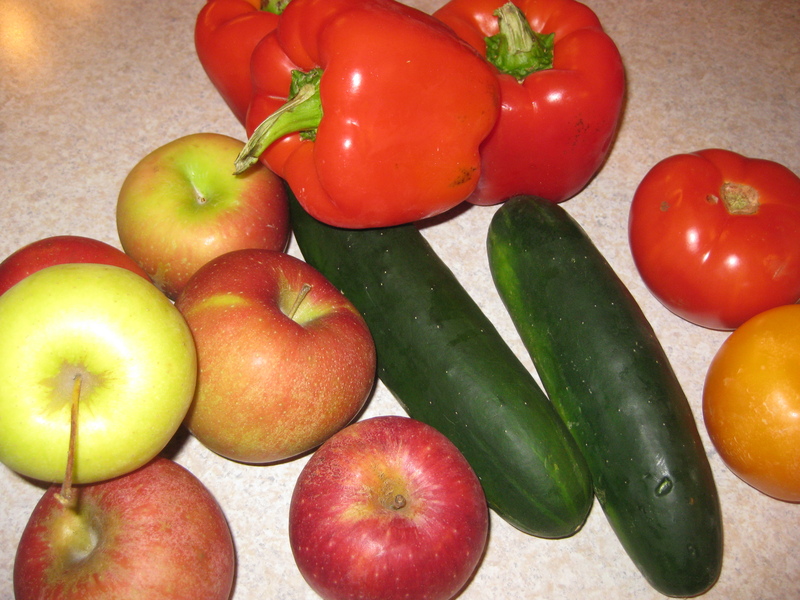 Categories: Healthy Dishes, Local Foods | Tags: apple, farm market, food, fruit, health, local foods, West Virginia | Permalink. I am currently in Philadelphia, PA for one of the very largest gatherings of nutrition professionals in the country. This event is put on by the Academy of Nutrition and Dietetics, and is an awesome networking event for dietitians and other food professionals. This is my first FNCE to attend- and I’m very excited to be here. 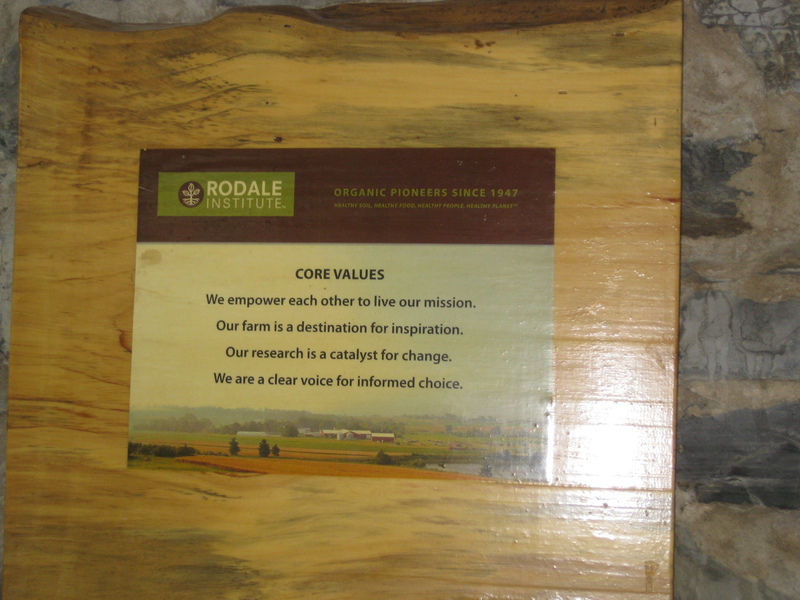 The event officially kicked off this evening, but today I got to attend a pre-conference workshop that was right up my alley: a Rodale Farm Tour. I’m a member of a dietetic practice group HEN (Hunger and Environmental Nutrition), which focuses on empowering members to be leaders in sustainable and accessible food and water systems. This practice emphasis lends itself well to partnership with organizations such as Rodale Institute. Rodale Institute has been pioneering in the field of organic agriculture since 1947, and I’ve read a lot of their publications, so I was excited to visit the farm today. 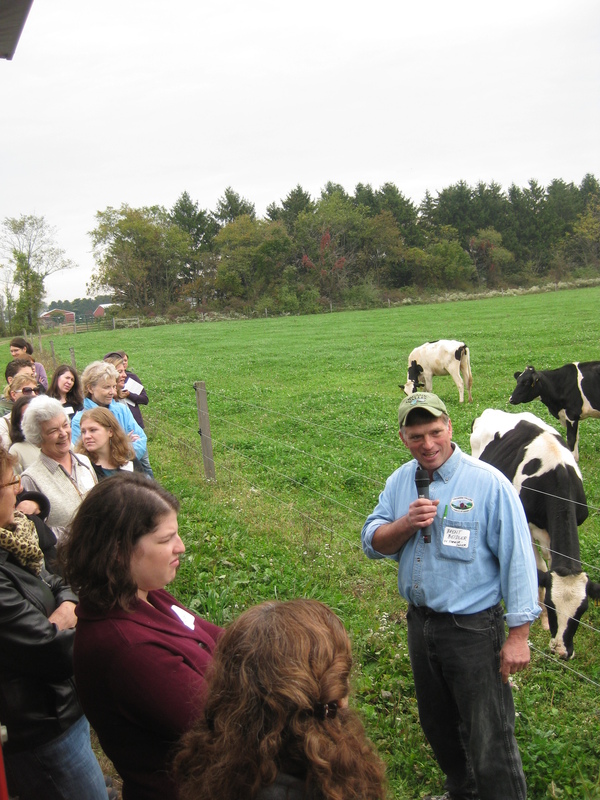 Here, an organic dairy farmer from Vermont spoke to HEN members about herd management and health. The farmer who actually owns the herd was at a family reunion today, but it was great to get a perspective from a New Englander who is also a member of the Organic Valley Family of Farms Cooperative. Here are the hard-working gals themselves. As a farm girl from Lancaster County, I was in my element in the rolling hills of southeast Pennsylvania. It was enjoyable to be there with a group of dietetics professionals from all over the country- Boston to LA. 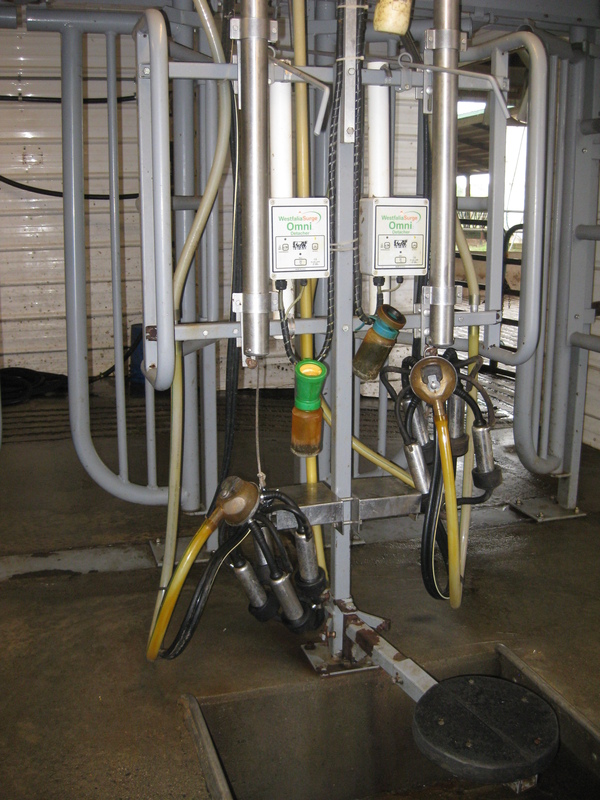 The milking equipment is pictured below. 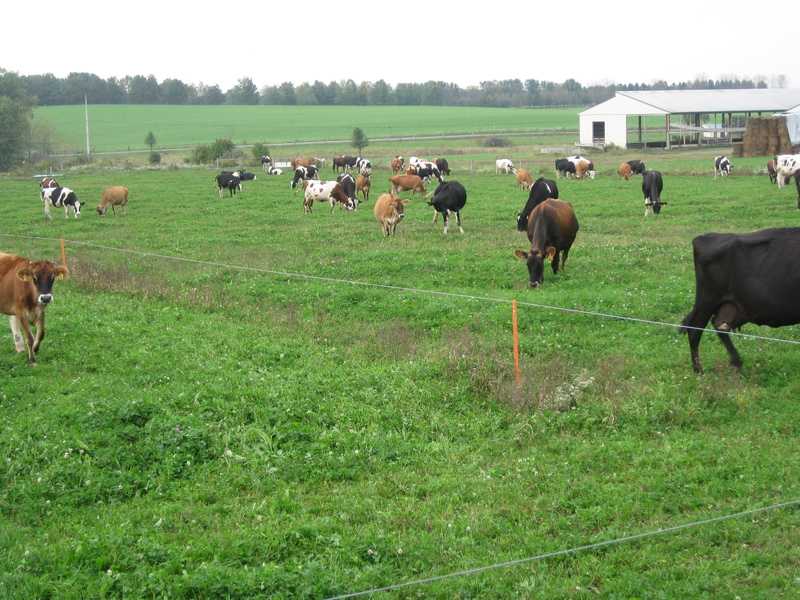 Research on milk quality and profitability is underway as this farm has recently transitioned to an organic model. It sounds like there are some pretty exciting results that will come out of these studies- I’m hoping to see some news headlines by the end of the year, but I don’t want to give out a spoiler! The tour ended with a fabulous lunch with Maria Rodale- and she even gave us a copy of her book “Organic Manifesto”. Dairy farming is hard work. 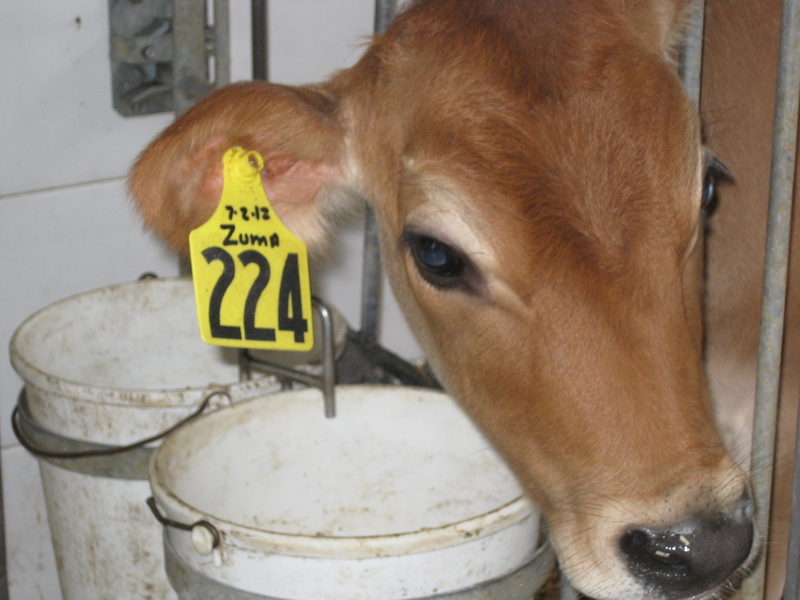 It’s a struggle to make ends meet financially- and selling organic dairy products provides an option for a more livable income for family farmers. Categories: Local Foods | Tags: agriculture, AND, dietetic internship, dietetic practice group, FNCE, food, food systems, health, HEN, local foods, maria rodale, nutrition and dietetics, registered dietitian, sustainability | Permalink. This time of year, I adhere to a personal mantra of “three apples a day keeps the doctor away”. Seriously, it’s not that unusual for me to slice an apple into my morning oatmeal, snag an apple as an afternoon snack, and enjoy applesauce or apple crisp or cake or pie for dinner. A large dose of cinnamon, a few cloves and ginger thrown in for a rounded out fall flavor. Can’t beat it. October is “National Apple Month”. It’s also “Farm to School” month. For this reason, I’m going to share about a little project that I completed in my most recent rotation. It has to do with apples, and farms, and schools. The Davis College of Agriculture, Natural Resources, and Design is not only home to the Division of Animal and Nutritional Sciences (where my program falls), but also the Division of Plant and Soil Sciences. 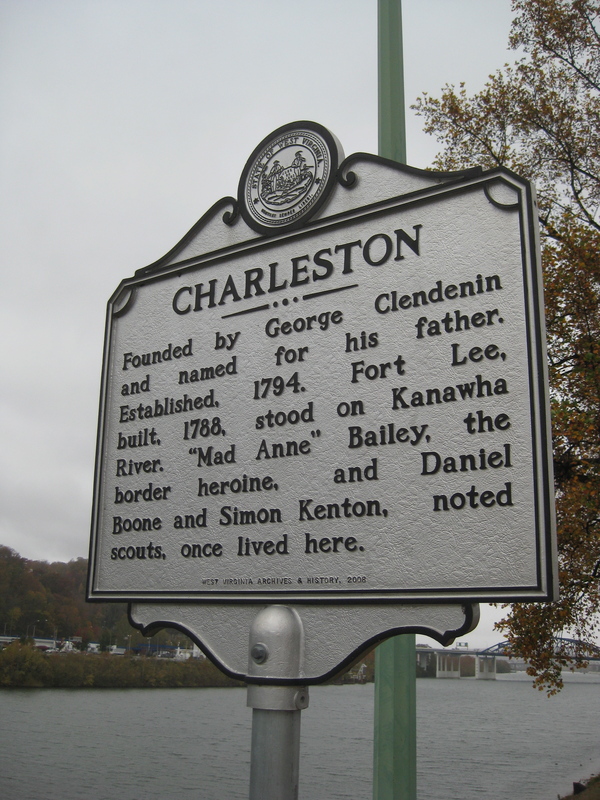 This division operates the Kearneysville Tree Fruit Research and Education Center located in Jefferson County, WV- in what is referred to as the “Eastern Panhandle” of the state. The fruits of this labor are then sold through the Plant and Soil Sciences farm, about 2.9 miles away from the dining hall where I was rotating. 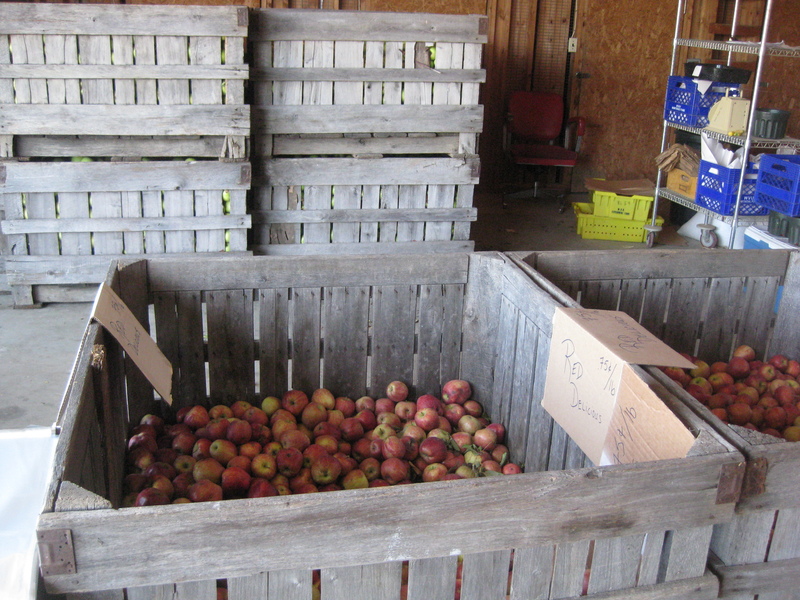 The apples are brought in large crates, and anyone can come to pick out their own apples. Varieties include Golden Delicious, Rome, Red Delicious, Honey Crisp and I believe a few others too. Availability varies, and this year was more limited than some, due to less than ideal growing conditions. So how does this connect to my rotation? 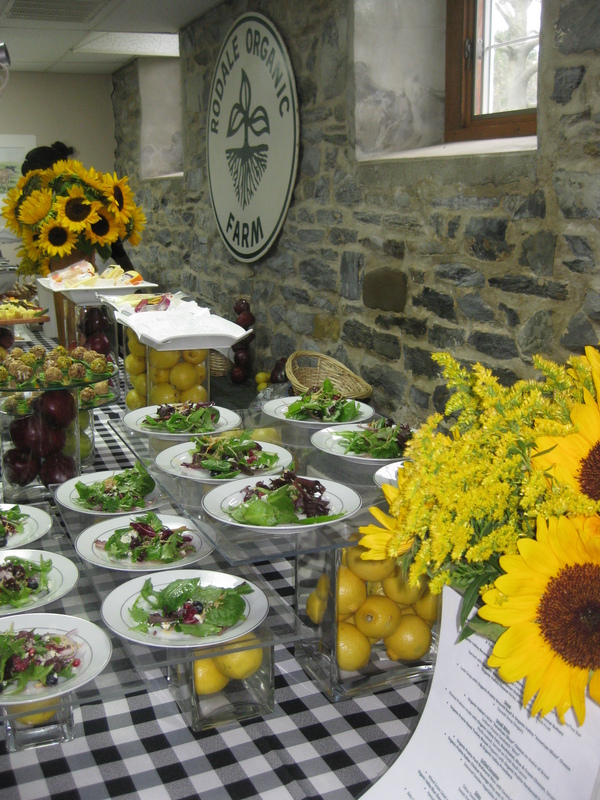 I needed to complete a “Process Improvement Project”, and chose to work on bringing local produce into the dining hall. I first spoke with the Director of Dining Services. They had gotten apples from the farm in the past, but this year it had not been made a priority, so my assistance in the project would be much appreciated. I made some phone calls, visited the farm, coordinated with dining facility personnel to cancel current orders of apples from the standard supplier, and got the ball rolling. One of the common issues with purchasing local food is the increased amount of labor required in bypassing the “conventional” food system. 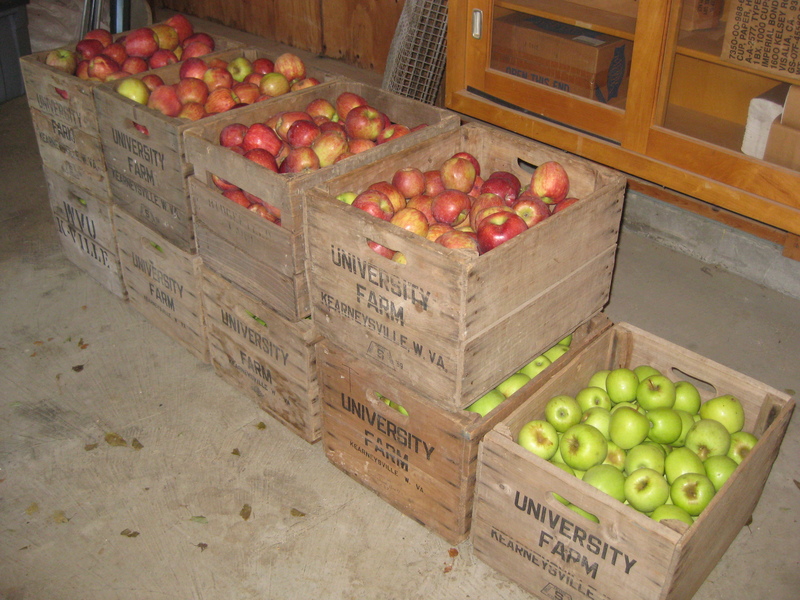 In this case, the individuals working at the farm did not have time to sort out apples that were needed for the cafeteria, and likewise dining facilities was short-staffed and unable to provide this labor and transportation. So myself and the Director of Dining Services stepped in the labor gap and counted out 2,300 apples. 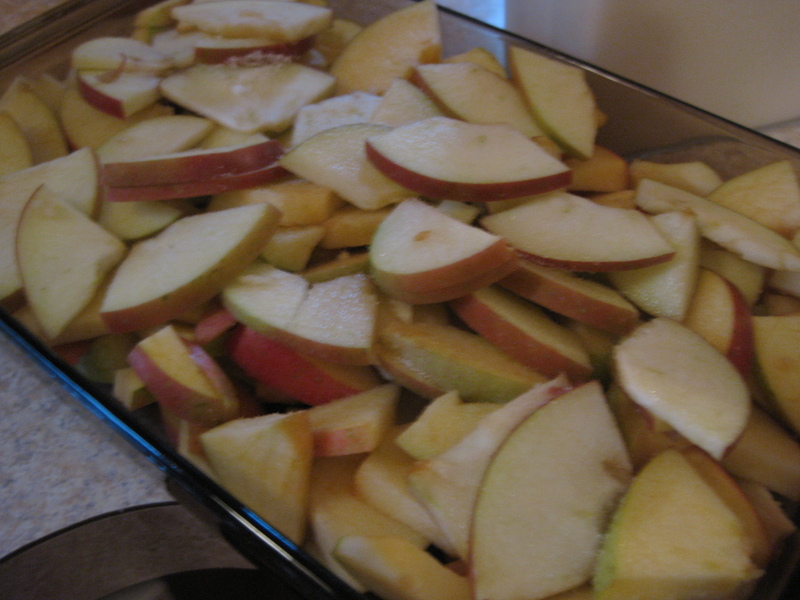 Yeah, it was a lot of apples. 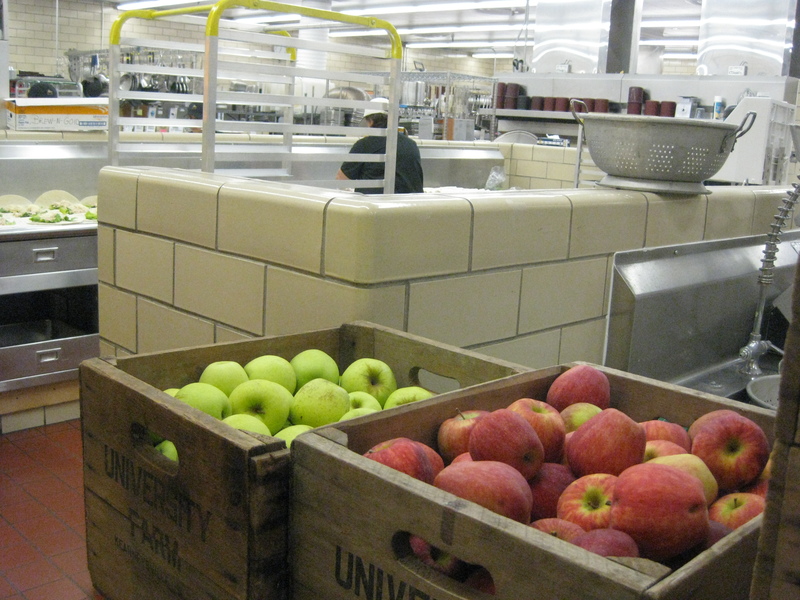 Apples were brought into the dining facility. Here they are- ready to be washed and put out for tasting! 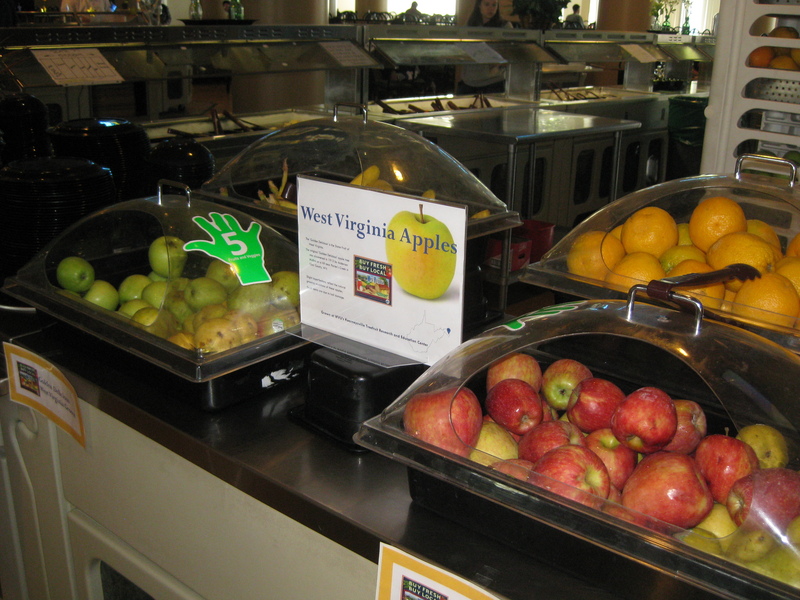 The apples were then placed in the cafeteria, along with point-of-sale advertisement that the apples were grown in West Virginia. I may get a little bit too excited about fresh food- especially when it is grown locally. When calculating the cost of purchasing the West Virginia apples, even including the additional labor required for sorting, the cost of purchasing these apples was slightly less than ordering through the produce contract. Buying local foods for use in foodservice operations can be done- but I will be the first to admit that it takes creativity, hard work, and persistence. To date, 176 colleges and universities nationwide have completed a survey on the Farm to College website indicating that they are integrating local food into their operation. There are also now Farm to School programs in all fifty states. Movement towards connecting consumers with the source of their food is growing (pun intended), but a lot more work remains. As a random bit of trivia- the Golden Delicious is the State Fruit of West Virginia- discovered in Clay County, WV around 1912 by a man named Anderson Mullins. There’s even a Golden Delicious Festival to celebrate it. 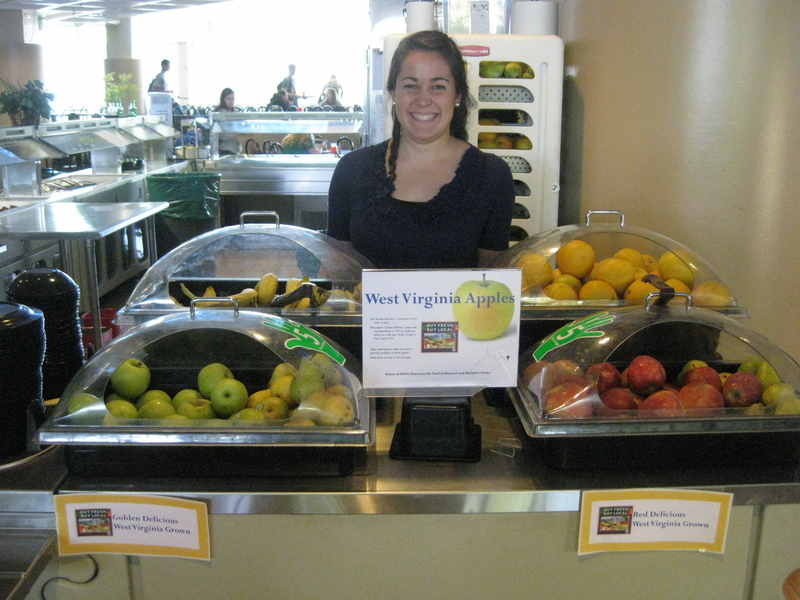 Categories: Food Service, Local Foods | Tags: agriculture, apples, dietetic internship, dining hall, dining services, food, fruit, local foods, sustainability, West Virginia | Permalink. Where’s the place to be in Morgantown on a Saturday morning at 8:30? At the corner of Spruce and Fayette streets, of course! 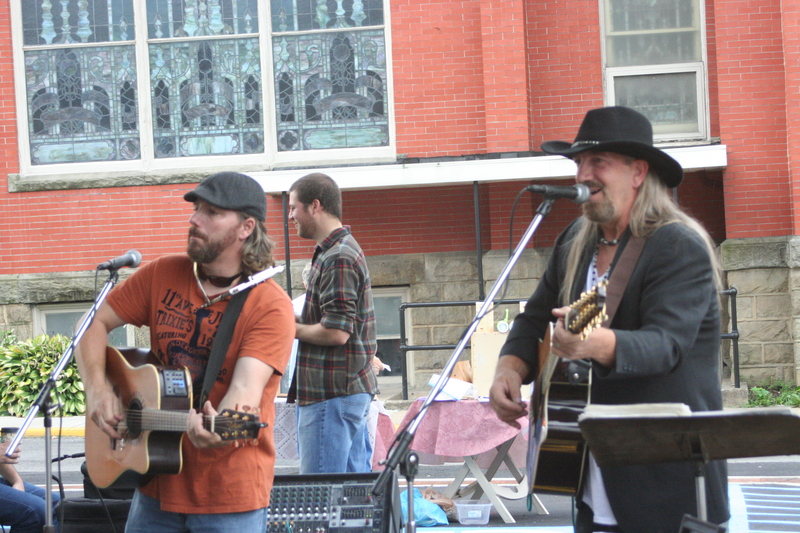 The Morgantown Farmers’ market runs from 8:30 to noon, and typically starts off long lines of customers streaming in front of the stands. For the earlier part of the summer the market was held at an alternate location while a pavilion was constructed. On September 22nd, the Morgantown Market Place officially opened for business, and market hours were extended until 1 PM for the Grand Opening. The day kicked off with a ribbon cutting ceremony. There was a great crowd, and even Monti the WVU Healthcare mascot was there to cheer on the market. The grand opening saw the highest customer total ever. 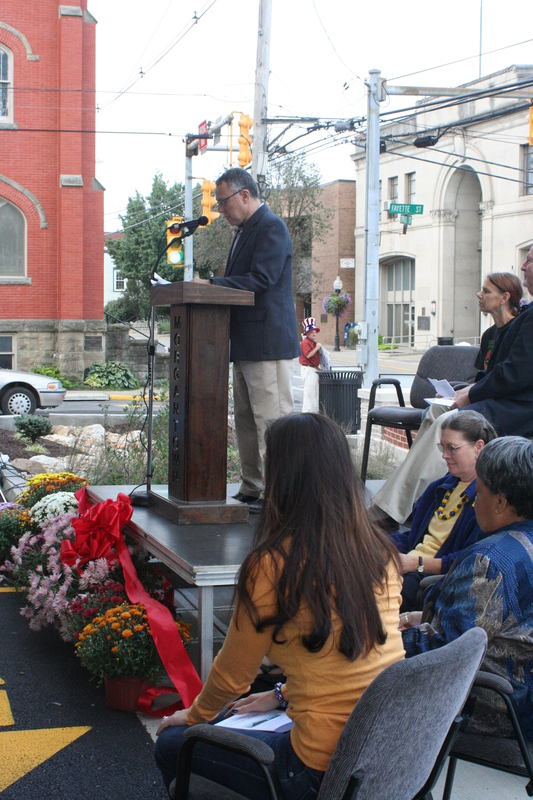 Jim Manilla, Mayor of Morgantown, spoke during the dedication of the building. It was a busy day under the pavilion, full of delicious flavors and great sounds. 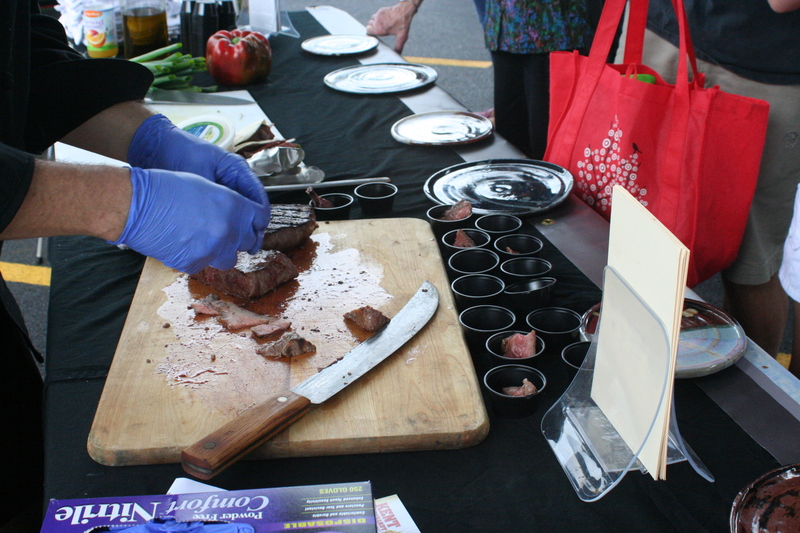 There was a cooking demonstration by Marion Ohlinger, chef & owner of the Richwood Grill. He used market goods to create a surprise menu, which included breakfast burritos (breakfast sausage, goat cheese, and eggs), steak, and goat fajitas (goat meat, onions, and peppers). Featured musicians of the day included The Short Brothers who kept customers dancing throughout the morning and One Bullet Barney, who kept the energy going with their electric punk blues. 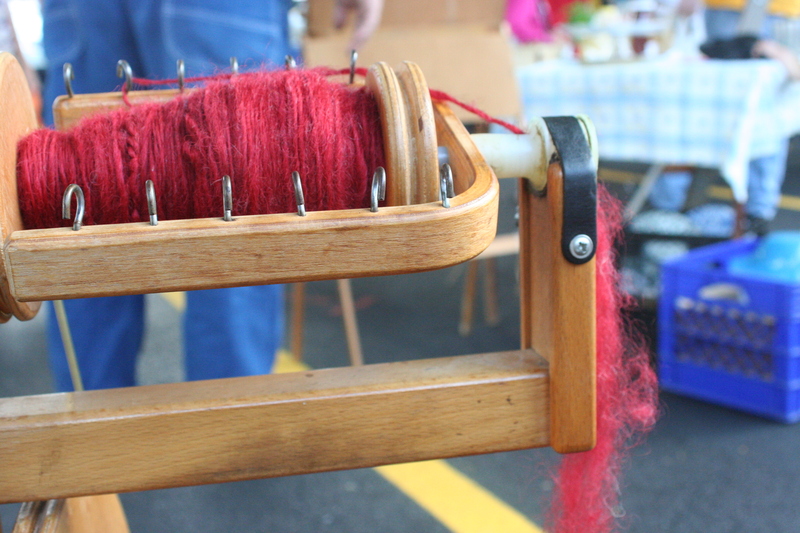 Other featured events from the day included a vendor demonstration of wool spinning, a live bee hive, and a “Green Morning” workshop by the Morgantown Municipal Green team. 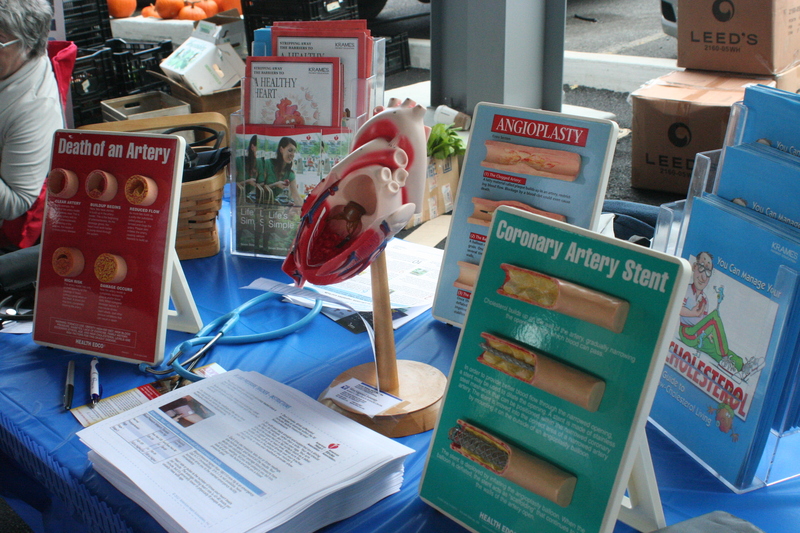 WVU Healthcare offered free blood pressure screening, free reusable market bags, and a “talk-to-a-nurse” station. In celebration of WVU’s Transportation Week, the WVU Transportation & Parking Authority came to the Market as our non-profit to promote sustainable & healthy ways of traveling. A bicycle rack is provided at the market for customers who choose to use pedal power to get around town. Although the pavilion is up, the project is not yet technically complete. A culinary station has yet to be installed. As a future dietitian, I’m especially excited about this as a way for exposing customers to new foods. There will be a second opening when the station is complete, with a “Taste of the Town” demo featuring 4 different chefs from Morgantown who will coordinate to use fresh market ingredients to create samples for customers. Phase 2 of the market project will probably include solar panels, but that is still down the road. The Grand Opening also received some great publicity from the Channel 12 News. 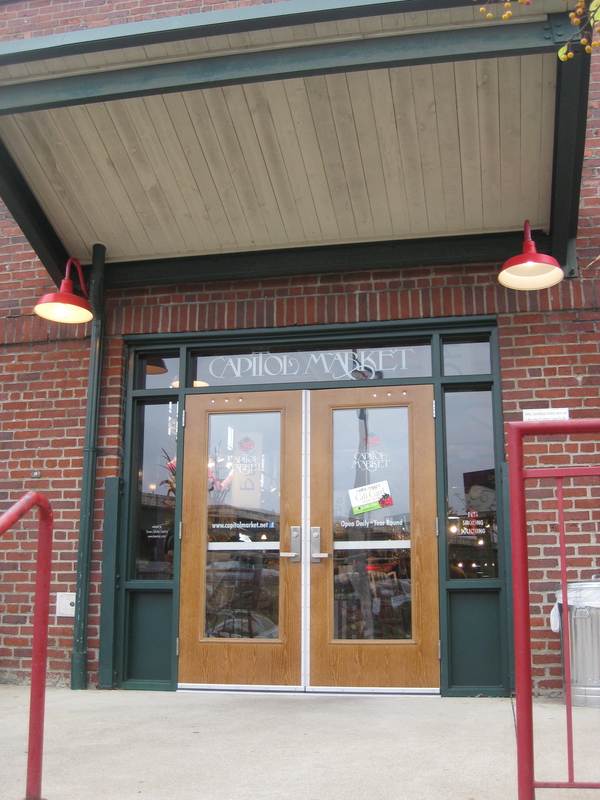 The Morgantown Market is one of my favorite Saturday morning activities here in town, and if you live anywhere in the area, it’s definitely worth checking out! *Note: This post was also published at wvfarm2u.org. Categories: Local Foods | Tags: farm market, local foods, Morgantown, sustainability, vegetables, West Virginia | Permalink. I recently came across an excellent handout on a sustainable diet through the Hunger and Environmental Nutrition Dietetic Practice Group (HEN DPG), of which I am a member. HEN is a special interest group within the Academy of Nutrition and Dietetics, the world’s largest organization of food and nutrition professionals, formerly known as the American Dietetic Association. This handout was compiled by Mary Meck Higgins, a Human Nutrition Specialist and Registered Dietitian working with the Kansas State University Cooperative Extension Service. I think she does an excellent job of highlighting some of the principles helpful in promoting personal health as well as the health of the planet. She reminds us of the importance of personal choice- we can’t expect the government or big industry to solve the world’s sustainability problems. These entities are shaped primarily by consumer demands. So how are you, as a consumer, going to respond? Choose nutrient-rich foods: Base meals on whole grains, fruits, legumes, and dark green, red, and orange vegetables. Choose fat-free or low fat dairy, lean red meats, and poultry without skin to reduce calories and saturated fat intake. Vary your protein- try non-animal sources. Choose water most of the time, and cook at home often. For more specific recommendations for your age, gender, and body size, visit myplate.gov. Eat locally produced foods when available: Choose foods that are in season. Visit a local farmers market or farmstand, join a CSA (Community Supported Agriculture), or try growing something of your own. Buy from businesses with sustainable practices when possible: This can affect not only the health of the environment, but local economic vitality. Support local restaurants who purchase from local producers. Choose certified sustainable seafood products. When you buy tea, coffee, or chocolate, choose at least some that is certified fair trade. Minimize avoidable food losses and waste: On average, households in the US throw away at least 14 percent of food purchases. Store perishable foods appropriately. [An example: since I shop for myself and I don’t eat a loaf of bread very quickly, I often store it in the freezer and simply pull out a slice or two and toast it to prevent waste]. Even excess milk can be frozen if you won’t drink it by the expiration date! Instead of peeling potatoes or apples, simply wash them well and eat the peels. Extra fiber, less scraps. Speaking of scraps, try composting them! For a variety of reasons, restaurants often generate a sizable amount of food waste- another reason to cook and eat at home. Limit energy use: Of the energy consumed in the U.S., nearly 20 percent is used for food production, transport, processing, packaging, distribution, storage, sales, and household food handling. Limit how often you drive to the grocery store. Better yet- walk or bike to get a bit of exercise at the same time! Wash with hot water, but rinse with cold water. Let your dishwasher air dry instead of using the heated dry cycle. Limit water use: Conserve water when preparing food by keeping an empty pitcher to capture water from the faucet while waiting for it to heat up. Use this to water plants. Use water-efficient kitchen appliances. Turn off the faucet in between rinsing dishes. Minimize packaging and wrapper waste: Carry a reusable water bottle instead of buying packaged bottled water. Keep your reusable grocery bags in the car so you remember to actually take them with you to the grocery store! Eliminate packaging when possible: purchase whole, unprocessed fruits and vegetables. Instead of buying small packages of food (i.e. individual yogurt cups), try buying a larger container and separating the amount you plan to eat out into smaller containers. Categories: Community Nutrition, Local Foods | Tags: agriculture, CSA, extension service, farm market, fruit, local foods, registered dietitian, restaurants, sustainability, vegetables, whole grains | Permalink.